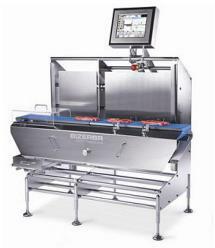 Bizerba is a worldwide leader of manufacturing retail scales, slicers, weigh price labeling equipment as well as checkweighing systems, industrial scales and software. We are a manufacturer founded in 1866 with approximately 2600 employees worldwide, including its headquarters and 3 production facilities in Germany as well as 16 subsidiaries and 69 national representatives. The Checkweighing system which fulfills the requirements of your products and even teaches itself to the product specifications, by a unique and innovative teaching mode. By optional feedback control, the filling process can be controlled and regulated to minimize the “give away”. The rugged modular construction system in stainless steel execution allows highest flexibility at plant integration and adaption. The direction of transport as well as the conveying height can simply be set or adjusted on site. Transmiting data through a variety of interfaces in multiple configurations. Via the Bizerba WM-3 weighing module, the CWL Eco simplifies integration to 3rd party systems. A few of the integration features of the CWL Eco includes: Data Interfaces to include RS232, RS422, Profibus DP, Ethernet, USB, Up to 12 configurable inputs / outputs, option to receive Scanner and Dimension data and send out DWS in one data string, simple Scale Protocol DPV0 and DPV1, easy interface to Bizerba Print and apply, supplied with or without external display, Bizerba configuration tool software makes system set up simple. 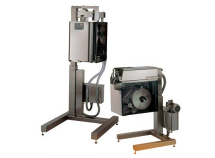 The CWP Neptune checkweighing system weighs and sorts unpackaged foodstuffs, is perfectly suited to the requirements for perishable foodstuffs thanks to its hygienic ergonomics, and lowers operation costs to a minimum through the reduction in components and parts subject to wear. Less room for bacteria, short cleaning cycles, low maintenance costs. The system requires no drive or guide rollers, as it uses only a single conveyor belt and only one engine. Fallen product residue from the tape, they cannot go to another part of the machine, even back in the product stream. Fallen product residue from the tape, they cannot go to another part of the machine, even back in the product stream. The belt can be easily and quickly remove the load cell is sealed tight. The belt can be easily and quickly remove the load cell is sealed tight. Corrosion by penetrating cleaning agents and water are a thing of the past. Corrosion by penetrating cleaning agents and water are a thing of the past. Everything is clean and hygienic water pressure in short cycles. Everything is clean and hygienic water pressure in short cycles. Fewer parts to avoid expensive downtime. Fewer parts to avoid expensive downtime. The GLM-I 40 deals with weights and volumes in larger dimensions with ease. Specially designed for labelling boxes, cartons and other large containers, its extra power makes it a very special member of the GLM-I family. 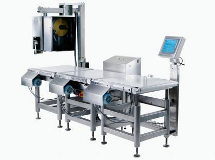 Standard equipment includes: Three belts, one each for separating, weighing and labeling, dynamic scales for weight-dependent price and product labelling for maximum loads of up to 15 kg, 30 kg or 60 kg, and a movable display and control unit and a labelling unit that can be adjusted both horizontally and vertically. The GLM-L is a fully automatic labeler to be combined with or fitted to conveying equipment or also as a total labeler, e.g. when connected to an automatic labeler system of the GLM series and in combination with a weighing and conveying unit in the higher load area. The unit produces labels with graphics and letter-quality print. There are three labeling applicators to choose from, each suited either for continuous flow or start/stop operation. The configuration and the input of all print data is easily done via the separate GT-CT touch terminal or online. In a network or use as a totals printer connected to a GLM-I automatic labeler, several devices can be operated via one central GT-CT touch terminal. Label positioning in the direction of travel can be set accurately. The label is applied to the package surface time-controlled via transducers. A label printout and starting the automatic labeler can be initiated via static inputs.